I happen to love the orange and pink color combination; it is a bright and cheerful palette, perfect for happy celebrations! The first time I spoke with Rachael about her engagement and Annapolis wedding plans, I could sense the excitement she felt to marry her fiance Russell. Rachael and Russell are such a sweet couple and they radiate happiness and love. 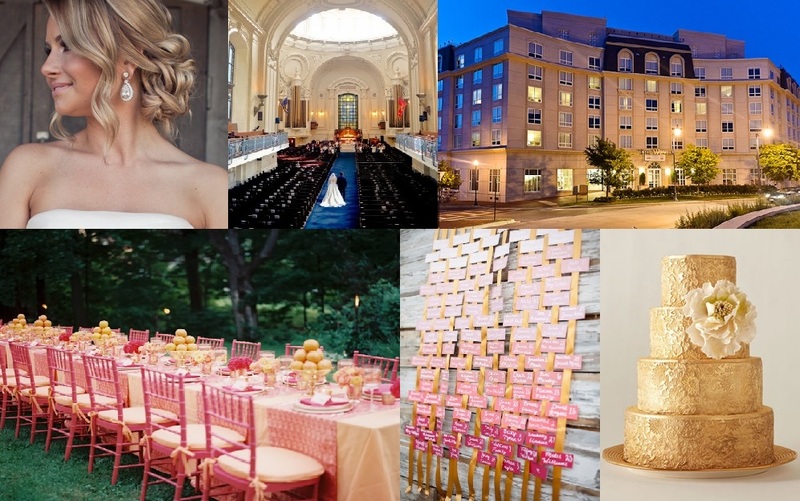 Their wedding will take place in June at the United States Naval Academy Chapel and the Westin, Annapolis. Having family in Ohio and Pittsburgh, everyone will be traveling to Annapolis for this special celebration. 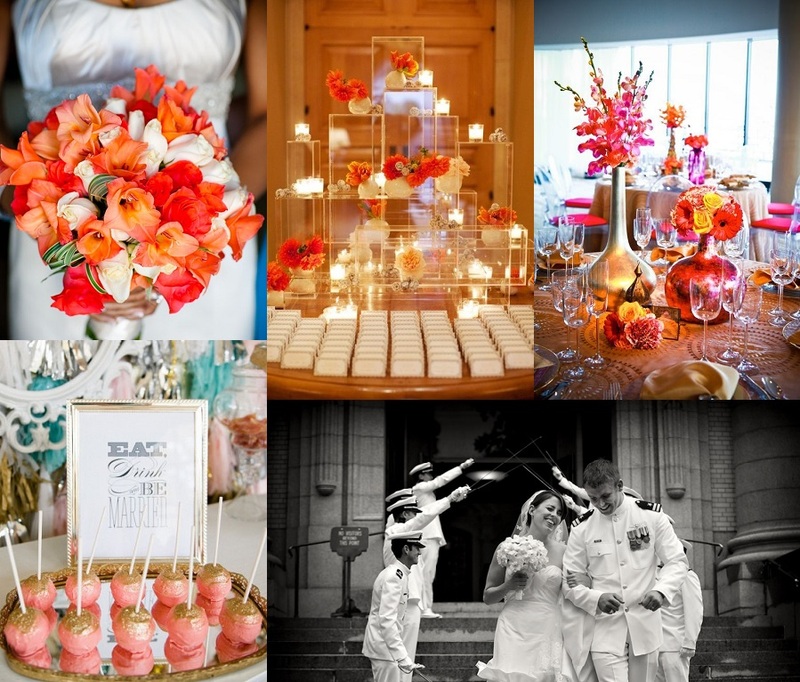 Rachael plans to incorporate orange, pink and gold details to make this happy day an elegant occasion. Rachael and Russell’s engagement story: March 2012 was a whirlwind for Russell and I and quite possibly the most exciting and life-changing month I have ever experienced. We moved to Connecticut, I landed my first marketing job, Russell reported to his first Submarine tour aboard the USS New Hampshire, I turned 24, and we got engaged! Whew! My birthday was on a Wednesday and I had just started working, so he suggested that we take it easy that night and celebrate Saturday at a local vineyard. We were new to the area but had driven past the vineyard a few times and every time I told him that I really wanted to go! Saturday came and we headed to the winery around 4:30. It was a beautiful place; they had live music playing and we did a wine tasting together. A little later in the evening he asked me if I wanted to go out on the porch that overlooked the winery and watch the sunset and I of course said yes. Once on the porch and after talking for a few minutes, Russell got down on one knee and proposed with the sunset in the background! It was such a beautiful moment. When we walked back inside, everyone in the tasting room had seen the whole thing and were cheering and whistling for us. The band announced “this next song is dedicated to the newly engaged couple” and played Unforgettable. Then, to our luck, a woman came up to us and said that she was a photographer and would love to get some pictures of us on our engagement night. The whole night was natural, exciting, memorable and I wouldn’t have changed a single thing. Wedding Plans: Russell is currently serving on a submarine in the US Navy which ultimately means he spends a considerable amount of time away from home. I’m excited to have him home and for this incredible day dedicated to celebrating the love we have for each other. We have family and friends coming in from all over the country, many haven’t been to Maryland before, so I am also looking forward to everyone enjoying Annapolis. It’s such a special place for us; it’s going to be a blast!